Season 5 opens with a distraught Judge Harry T. Stone (Harry Anderson), unaware he has his job back, planning to pull off a maniacal prank against the City of New York. Dan (John Larroquette, winning his fourth Emmy(r) for Outstanding Supporting Actor in a Comedy) is given an unwanted overseas assignment, public defender Christine (Markie Post) comes to the rescue when Roz (Marsha Warfield) has trouble with her boyfriend. Meanwhile, Bull (Richard Moll) gets struck by lightning and thinks God spoke to him and Mac (Charles Robinson) works on curing his technophobia. Featuring guest stars Teri Hatcher (Desperate Housewives), Mel Torme and Don Cheadle, these 22 episodes on 3 discs are where non-stop laughter is the final ruling. 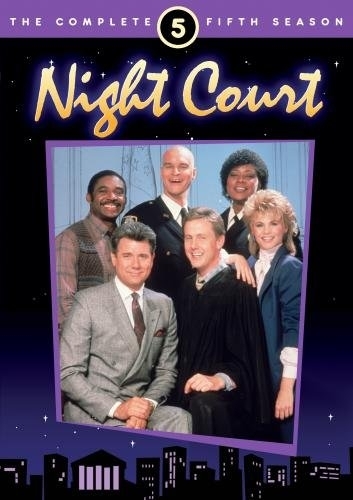 NIGHT COURT has always been bizarre and off-the-wall, but that’s been a large part of its charm. Season 5 is no different in this respect. There some totally crazy moments in it, and brilliant script-writing. We can only wish that all legal situations were this light-hearted! The cast is superb, and it’s always terrific when Dan (John Larroquette) gets his put-down.